The Port of Fujairah has banned the use of open-loop scrubbers, Harbour Master Capt. Tamer Masoud said in a faxed Notice to Mariners (NTM) today. It is the latest big bunkering port to make such a move, following similar action by Singapore last year. 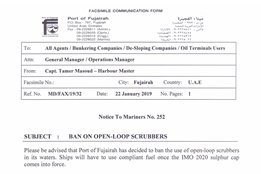 "Please be advised that Port of Fujairah has decided to ban the use of open-loop scrubbers in its waters. Ships will have to use compliant fuel once the IMO 2020 sulphur cap comes into force," NTM 252 reads. "Please advise all your principals accordingly." It was not immediately clear when the new rule would come into force, or if the ban only covered open-loop scrubbing. While Capt. Masoud did not expand on why the port had implemented the ban, the practice of open-loop scrubbing has come under heavy criticism of late due to concerns over its environmental impact. Scrubber advocates continue to maintain the practice is not harmful to the marine environment. Fujairah is one of the world's top three biggest bunkering destinations by volume, along with ARA and the world's biggest bunkering port, Singapore. Singapore announced in November it would ban open-loop scrubbing from January 1, 2020 "to protect the marine environment and ensure that the port waters are clean." China this year has also made a similar move. While NTN 252 has not yet been posted on Port of Fujairah's website, the full notice was made available via NSI's 2020planning service here.